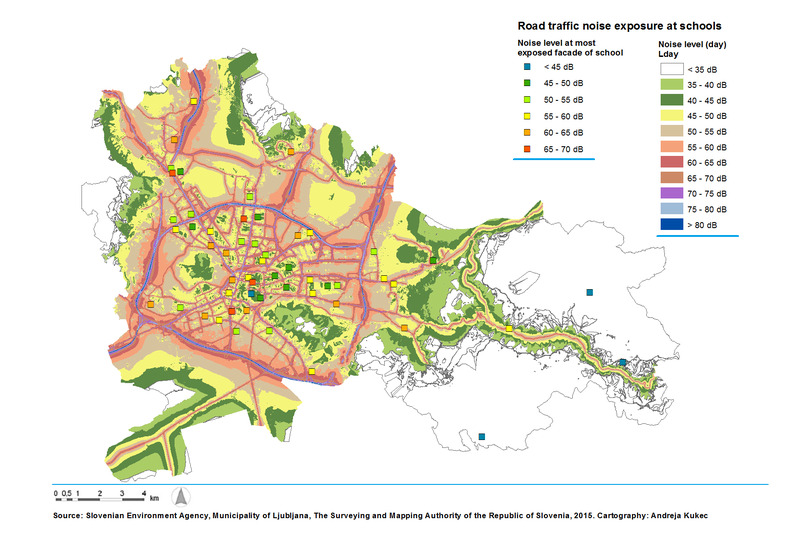 Children in some primary schools and kindergartens in the Municipality of Ljubljana are exposed to road traffic noise. Of 105 kindergartens and 54 elementary schools, the limit value of environmental noise for playgrounds 55dB(A) determined by the WHO was exceeded on all facades at only one kindergarten. In 29 elementary schools and 48 kindergartens, this limit value was exceeded at least on the most exposed facade. In the school year 2013/2014, 11,925 pupils attended those 29 elementary schools and 5,946 children attended the mentioned 48 kindergartens. According to the data, we assume that noise from road traffic at most schools and kindergartens does not disturb kids at play and rest. This indicator shows potential exposure of children in kindergartens and elementary schools to road traffic noise in the City Municipality of Ljubljana (MOL). Exposure of children refers to daytime (Lday) road traffic noise load for roads with over one million vehicles per year. The use of the Lday indicator is grounded on the fact that education in kindergartens and elementary schools takes place during the day. The Lday indicator is defined as a long-term (permanent) noise level according to SIST ISO1996-2, for the daytime period (from 6 a.m. to 6 p.m.) of all calendar days in a particular year (Decree on limit values for environment noise indicators). The Lday data was summarised from the amended noise map for the MOL and refers to the state of road traffic in 2012. The noise map covers the area of 275 km2 with 274,462 permanent residents (data sources: Statistical Office of the Republic of Slovenia, Surveying and Mapping Authority of the Republic of Slovenia, City Municipality of Ljubljana, 2012). Sound level is expressed in decibels (dB(A)), in which human ear sensitivity in various frequency ranges is taken into account. The most acceptable parameter for the description of average noise level is Equivalent Continuous Sound Level (Leq) or the Equivalent A-weighted Continuous Sound Level (LAeq). The Equivalent Continuous Sound Pressure Level (LAeq) is the average sound pressure level over a given period expressed in dB(A). The noise indicator LAFmax is the maximum A-weighted sound level value (Laf) over a given time interval or during the measurement period (SIST ISO 1996-1,2). Noise is an unwanted, disturbing sound. In schools, noise during classes disturbs communication, reading, learning, memorising and solving of demanding tasks, while in kindergartens, it disturbs various activities and sleeping during nap periods. Also, noise can be disturbing in playgrounds as it disturbs communication and agitates children. According to World Health Organisation (WHO, 1999) recommendations, the risks to children's health and well-being related to environmental noise need to be reduced. Slovenian Environment Agency, Municipality of Ljubljana, 2015. - good planning of new kindergartens and schools. - Pursuant to the Rules on protection against noise in buildings (Official Gazette of the Republic of Slovenia, No. 10/2012) and the Technical guideline TSG-1-005:2012 – Noise protection in buildings, noise levels in classrooms caused by noise sources outside the buildings may not exceed 35 dB(A) (LAeq). The WHO recommends the same limit value (WHO, 1999). Individual, short-term noise events may not exceed 40 dB(A), LAFmax value (TSG-1-005:2012). - Pursuant to the Rules on protection against noise in buildings (Official Gazette of the Republic of Slovenia, No. 10/2012) and the Technical guideline TSG-1-005:2012 – Noise protection in buildings, the limit value of environmental noise in accommodation facilities may not exceed 30 dB(A) (LAeq). The WHO recommends the same limit value for nap rooms in kindergartens. Individual, short-term noise events may not exceed 45 dB(A), LAFmax value (WHO, 1999). These values are important, as children take naps in kindergartens during the day. - The WHO recommends that equivalent value of environmental noise level LAeq at outdoor school playgrounds may not exceed 55 dB(A) (WHO, 1999). - The recommended echo time in empty classrooms is between 0.5 and 0.8 seconds (WHO, 1999). The same echo time is recommended by the Technical guideline TSG-1-005:2012 – Noise protection in buildings. In the school year 2013/2014, a total of 21,084 pupils attended 54 elementary schools and a total of 13,259 children attended kindergartens in the City Municipality of Ljubljana (MOL). The assessment of noise exposure of elementary school facades showed that road traffic noise exceeds the limit value Lday 55 dB(A) (recommended value of equivalent environmental noise LAeq for playgrounds near kindergartens and schools, WHO, 1999) at least on the most exposed facade at 29 elementary schools (53.7% of all schools). Noise load did not exceed the value of Lday = 55 dB(A) on all building facades at any of the 54 schools. The limit value of 55 dB(A) was not exceeded on any of the facades of 25 elementary schools (attended by 43% of all pupils). These schools are located in the most suitable environment as regards road traffic noise. According to available data, we assume that in most elementary school classrooms, road traffic noise does not disturb classes. Indoor noise levels have not been estimated. For precautionary reasons, we recommend indoor noise measurements be carried out in buildings where the noise indicator Lday on the most exposed facade exceeds a noise level of 65 dB(A). The assessment of exposure of kindergarten facades showed that 48 kindergartens (45.7% of all kindergartens) are exposed to road traffic noise exceeding Lday 55 dB(A) from at least one direction. The noise load only exceeds the value Lday = 55 dB(A) on all facades of the building at one of 105 kindergartens. The limit value of 55 dB(A) in not exceeded on any of the facades at 57 kindergartens (attended by 55% of all children). This means that these kindergartens are located in a suitable environment even for outdoor playgrounds. According to the available data, we assume that in most kindergartens, road traffic noise does not disturb children at play and rest. Indoor noise levels have not been estimated. For precautionary reasons, we recommend indoor noise measurements to be carried out in buildings where the noise indicator Lday on the most exposed facade exceeds the noise level of 65 dB(A). Critical effects of noise at schools and kindergartens include communication disturbance, information gathering disturbance (comprehension and reading) and increased agitation (WHO, 1999). Children are more disturbed than adults from daytime environmental noise until they have fully developed listening skills. Noise disturbs children’s learning in the critical phase of their development, as children have less capacity than adults to cope with environmental stressors (Stansfeld et al., 2005, Stansfeld and Clark, 2015). Road traffic noise significantly disturbs reading performance in children when average values on one facade reaches or exceeds 70 dB(A). Aircraft and road traffic noise is more disturbing than train noise. Individual, short voice signals are more disturbing to children aged 7–11 years; the highest noise impact was recorded in children learning maths and natural science (Shield and Dockrell, 2003). Impacts of noise from indoor sources in schools on children's learning ability have been less studied. Here, the acoustics and echo time play an important role. Children who had been exposed to noise levels of 75 dB(A) enjoyed an improvement in their learning success after their classrooms were acoustically refurbished. Older children are more aware of noise, while younger children are more agitated by it. Noise caused by sirens, motorbikes, trucks and trains was found to be the most disturbing (Shield in Dockrell, 2003). School children exposed to elevated noise levels (LAeq,8hours > 55 dB(A)) have significantly decreased attention and social adaptability, and increased opposing behaviour in comparison with school children who were not exposed to elevated noise levels. A study of the impact of noise on the performance of demanding tasks was carried out at the Faculty of Education in Maribor. Twenty pupils aged 13–14 years were exposed to noise levels of 30-40 dB(A) and 80-85 dB(A). The tasks required attention and memorisation. The results of the study confirmed the expectations that the effectiveness of performing monotonous tasks depends on the noise level in the learning environment (Fošnarič, 2003). The impact of environmental noise is becoming an increasing problem in Europe. An assessment of the burden of disease from noise in western European countries showed that one in three Europeans is agitated by noise during the day, while one in five Europeans is disturbed by noise during night-time sleep. More than one million healthy life years are lost every year from traffic-related noise in western Europe (WHO and EC JRC, 2011).